Why make the effort? You are not allowed to fly into the U.K. with an in-cabin pet, so people who prefer to travel within arm’s reach of their dog have to be creative: One of the options, as I mentioned in this post, is to rent a car and drive it (and you, your pup and who/whatever else is in the car) onto a Eurotunnel Le Shuttle train. How can I recommend it to you unless I try it myself? Short story: It all worked like a charm, and was surprisingly pleasant as well as easy. There are some (low) hurdles to jump over, so timing is an issue, and there are some costs to consider and budget for. 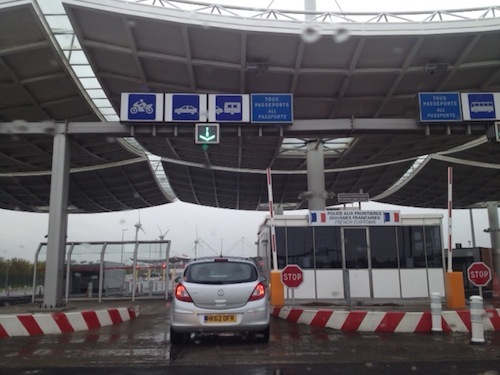 Before you drive up to the embarkation plaza in Calais, you need to have in hand not only your own passport but also your dog’s “passport.” In theory, and no doubt in practice too, the same paperwork that you obtained to bring your pup into France will also work to bring her into the U.K. Per DEFRA: “For non-commercial movements, the Annex 1 or Annex 2 certificate is valid for entry into the EU for 10 days from the date of issue and remains valid for a total of four months from the date of issue for further intra-Community travel.” We decided, however — for the sake of having the experience, and because we thought it might save time if the border folks were handed a familiar document — to get Chloe an E.U. pet passport. I’ll write about that in a separate post, and the fact is, having a “pet passport” really doesn’t mean much for a dog from a non-E.U. country. It’s essentially the same information that was in her health certificate, copied into a blue booklet and backed up by an examination from a French veterinarian. He not only verified that Chloe was in good health, he also provided the second thing you’ll need before arriving in Calais: The tapeworm treatment that the U.K. requires, and a note (in our case, in her passport) stating that she received it in the specified time frame (“Not less than 24 hours and not more than 120 hours (1 to 5 days) before [her] scheduled arrival time in the UK”). There are a couple of tapeworm treatment options; Chloe got a pill. Before you leave your vet’s office, make sure that s/he writes down the time that the treatment was administered, not just the date (and in European, 24-hour time, i.e., 13:40 rather than 1:40 pm — your vet will be European, so it’ll happen, but double-check it to make sure). Here’s a link to Eurotunnel Le Shuttle’s useful summary of what’s required to get on the shuttle in Calais (it’s essentially the same as what I’ve described, but it calls out the microchipping requirement separately — you’ve already dealt appropriately with your pet’s microchip, however, in the process of getting her health certificate). You will need a car (please note that some car rental agencies won’t rent a car one-way into the U.K., and the ones that do add a truly remarkable surcharge — which explains why we decided to return to France to fly home), and you’ll be happier with a reservation on the Eurotunnel Le Shuttle, though when we were traveling (mid-week at the beginning of November) there was plenty of room on earlier/later shuttles. I could not use my U.S. credit card to make an on-line reservation, and succeeded in getting a reservation only by getting my credit card company rep on the line and calling Eurotunnel Le Shuttle with him. A further twist? I could not call the U.K. number for the shuttle from the U.S.; happily, I could call the French number, and the shuttle’s reps speak English no matter what country they’re located in. 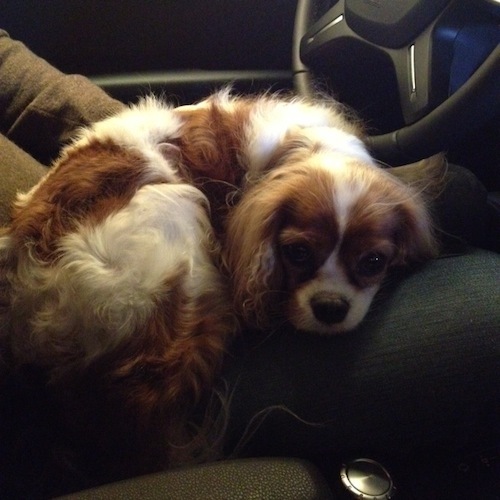 So there you are, in your rented or borrowed car, with your reservation, dog, and paperwork in hand. You drive through Picardy, and history, and you arrive in Calais. The very first thing you must do (after taking Exit 42 off the A16 motorway) is look for the signs for the Pet Control Point, because you have to get your pet and her paperwork checked before you proceed towards the gigantic tollbooth. 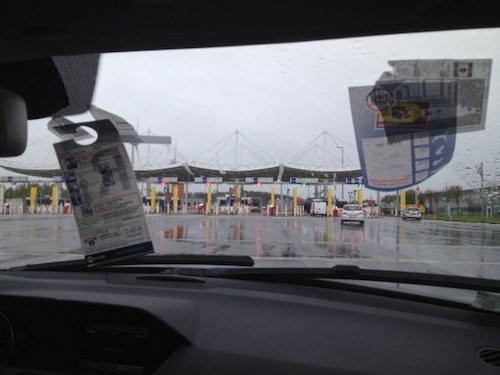 We arrived on a grimly rainy day, and were in a desperate hurry; please forgive the pictures. Ignore, for a moment, the big tollbooth structure that dominates the scene and beckons you forward. Instead, follow the (criminally small) yellow paw print sign, pointing you to the right. 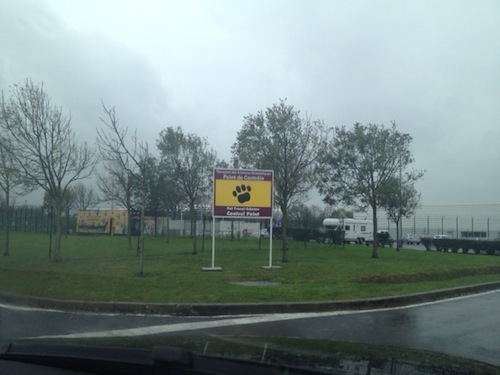 As you turn to the right, you’re given a much larger yellow paw print sign. The control point is in that low building behind it. Drive into the parking lot, and bring your pup and her paperwork inside. A panorama of the Pet Control Point building and the fenced dog-walking area next to it. 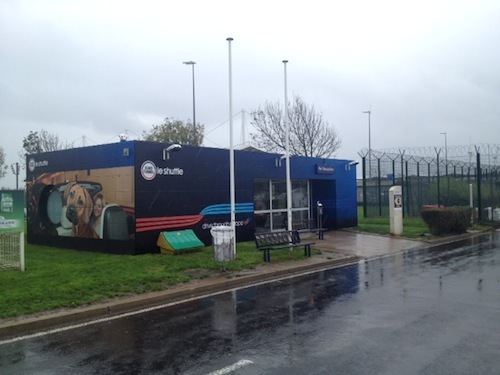 The Pet Control Point building, as it looks on a rainy day in early November, approached at a high rate of speed. Inside, we plopped Chloe’s carrier on the counter and invited her to poke out her head, so that the control officer could run a wand over the back of her neck to read her microchip. She looked through Chloe’s passport (I had Chloe’s U.S. paperwork in hand, as a back-up, but it wasn’t needed) and gave us a tag to stick to our windshield. We exited the pet control area and turned right towards that tollbooth structure you saw in the first photo. Machines offered us the chance to buy a ticket or claim our reserved ticket; we did the latter and were given another tag, this one designed to hang on our rear-view mirror. If we had arrived early, we could, at this point, have sauntered into the terminal for snacks and magazines and a bathroom break. 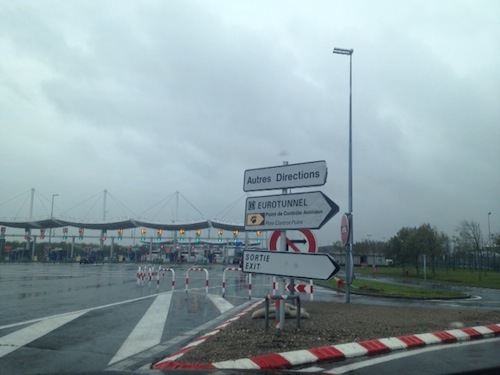 As it was, we hurried onwards to a booth containing a French customs officer, who waved us on to what turned out to be the U.K. border, right there in Calais. We assured the U.K. officer that we’d be returning tout de suite to France, and had reservations on a flight back to the U.S. He looked over what he could see of us past all the stickers, decided we were harmless, and stamped our passports. We finally caught up to our fellow passengers, joining the line of cars boarding the train. Following our fellow passengers onto the train. 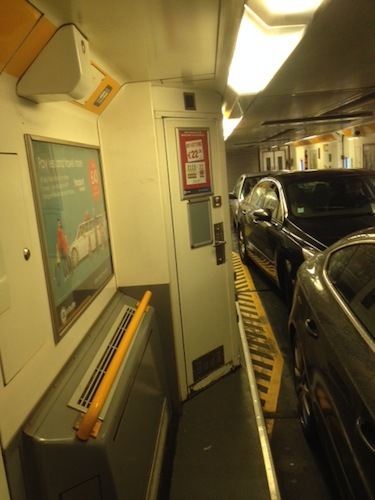 Cars are parked on two levels; we were on the lower level going to England, and on the upper level on the way back. They look exactly the same; the only difference is the extra gut wrench of driving onto a train and then immediately up a ramp, in an unfamiliar car. Once you’re parked, thick barriers swing closed between the train carriages. You turn off your car, put on the hand brake, and open your windows halfway (to keep the pressure changes from being bothersome). You and your car mates can doze, or watch movies on your portable electronic devices, or snack, or read. You cannot take flash photos (it distresses the equipment keeping an eye out for fire), and there is no wi-fi. There are modest but workable bathrooms, every 2-3 carriages apart, and you can walk to them. There is no café car, and no other attraction that would tempt you to walk elsewhere on the train. Parked on the train. The barriers have been deployed; doors on each side let shuttle employees and passengers move between carriages. The train began to move, and 35 minutes later we were in Folkestone. So quick, compared to the Hovercraft and ferry rides I’ve taken in the past. And what could be more comfortable than this? Once you reach Folkestone, you hear an announcement warning you to drive on the left side of the road, and to set your clocks back an hour. The doors swing open, and you drive off the train and onto the M20 (dear God, on the left). 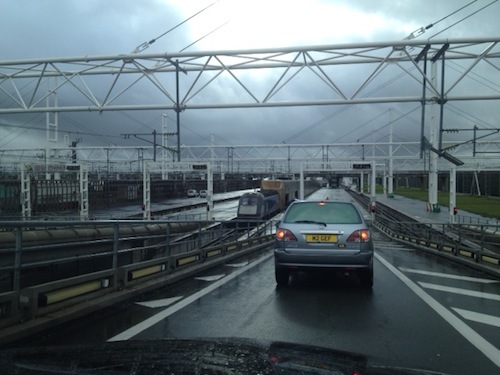 Returning to France on the Eurotunnel Le Shuttle was even easier. We were rattled, initially, by not seeing any kind of sign for pet control. We collected our hanging tag, and went in search of The Authorities. This sign in particular, located near the Folkestone entrance, threw us for a loop. It was yellow! There was a paw, and an arrow! 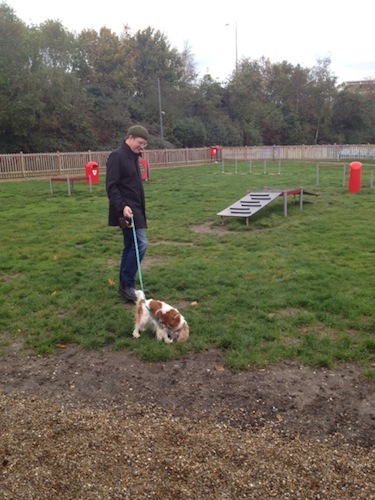 And yet, there was no Pet Control Point…. There is a large and pleasant dog-walking area, equipped with agility structures, a water fountain, and benches, but it’s purely a convenience. There was no building next to it, and no signs indicating that pet owners should do anything except pick up their dog’s poop. Baffled, we inquired inside the terminal, repeatedly, and the (very patient) lady at the information desk repeatedly told us there was no Pet Control Point in Folkestone. 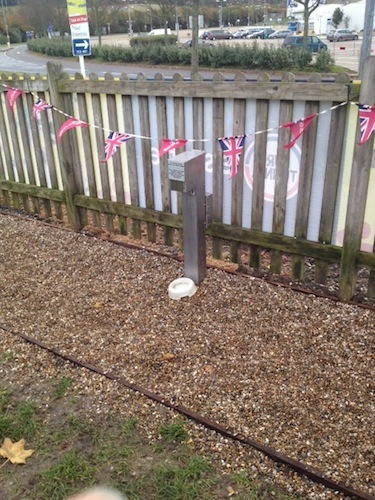 Visual proof that there’s a water fountain — how unexpected! About those expenses I mentioned: It cost about 50 € to get Chloe’s pet passport (an optional expense); another 50 € to get her tapeworm treatment (not optional); and 15 £ each way to add her to our Eurotunnel Le Shuttle trip (bringing the total shuttle cost to about 70 £ each way). Why was I charged in pounds rather than euros? The shuttle rep offered me the choice in our phone call, and then chose pounds for me since it was a better rate that day. auto border Britain Calais car cat Channel checklist Chunnel Customs dog driving England Eurotunnel Eurotunnel Le Shuttle Folkestone France in cabin pet pet control pet passport pet scheme rental requirements tapeworm train U.K.
That is such a good story, Gery! 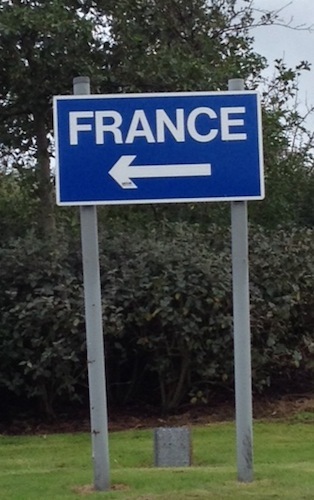 How I love France…. You know, the driving part was actually okay, even with an American/French style car on British roads. I think I would have preferred a British style car, partly because it would have been slightly easier to see oncoming traffic when making left-hand turns, and partly because the oddity of sitting on that side would have reminded me that I was doing something unusual (there was just a bit of a tendency to get comfortable and return to turning into my accustomed lane). Overall, though, it was really no problem. It was crucially important, for me at least, to have an automatic car. So I just did some research, and it looks like there’s an Avis stop (not a full-on office, but rather an affiliated Holiday Inn) near the Folkestone Chunnel terminal. Avis, however, was one of the rental agencies that wouldn’t let me rent just one-way into England. Hertz would, but its closest office appears to be in Dover (about 20 miles away). Avis’s closest real office is in Dover too. I suppose the thing to do, then, would be to drive the 20 miles to Dover, return the car, and get a taxi to the Dover train station. From past experience, and from a reader’s reports, I’d avoid driving into London at all costs…. You are fabulous, as always—and you have so much more in the werewithal department than I’ll ever have. As soon as I read the “DEFRA” sentence, I thought to myself, “Welp! That settles it, I’m never bringing a dog anywhere! In fact, I’m going back to bed!” I would be incredibly intimidated by even the simplest procedure. The next time you do this, though, I expect a full report on the steps for bringing a horse aboard le Shuttle. I saw a blank for one on the form, so it must be possible! I too was totally intrigued by the horse option — perhaps there’s a Horse Jaunt blog out there…. I read your article. It was interesting. I read too on the German castle I like it too. Soooo helpful that you included pictures of what to look for! I will be doing this trip in 2 weeks…but I am moving to Scotland. You mentioned tellin them you weren’t plannin on staying….is there a different procedure for the dog if you are?? I plan to return thecar back to Calais immediately after dropping “le pup” and my bags and my mom in a hotel in folkstone (one way rental cdg to Calais). Gettin back to Folkstone after returning the car, I willbe a foot passenger….were people offering seats in their cars to foot passengers??? Otherwise I have to take the ferry to Dover. Thanks tons! Hi, JM — How I envy you! Every good wish to you and your pup in this new chapter in your lives! No, there’s no different procedure for folks who are staying — you’ll like get more questions than we did, but there’s nothing different that you need to do about your dog. Alas, no, there weren’t any hitchhikers in either direction — it’s a pretty big, impersonal space that you really can only approach by car, so there’s no real opportunity to catch a ride. You’re right — your choices are going to be taking the Eurostar train (which you can, because you won’t have your pup with you on that leg), or a ferry. Safe travels, and please let us know how it goes! Thanks for that info. I went to my closest USDA office (about a 2 hr drive to Miami) yesterday. I got there and they said “you are missing a form”. UGH. Apparently I missed something in your blog and USDA site and my vet was actually sick and let me come to his house for the paperwork to be completed that day (so if he knew about it, he didn’t remember…and since I didn’t have it with me, he didn’t fill it in!). Luckily they gave me a list of very close vets where I could go get the form filled out. It was a $100 error, though! 🙁 The form is 7001 http://www.aphis.usda.gov/library/forms/pdf/APHIS7001.pdf) Really frustrating to have to get a Miami vet to fill one little form for $100! So, now the forms are all stamped and just need to get his tapeworm pill done in a few days and we are off! Oh, also, my USDA forms were not stamped with ink, they were done with an embosser, so it is a raised seal that apparently doesn’t copy. Now THAT is a kind vet, JM. I’m so sorry to hear about the missing document! It wasn’t one my USDA office required for this trip to France (we got one like it LAST time, 3 years ago — I assumed the difference was due to the fact that the U.S. airlines now don’t require a health certificate for in-cabin pets). VERY interesting that your USDA office told you it was necessary — that’s the first time I’ve heard of a difference between one USDA office and another, though I suppose that shouldn’t be surprising. The U.S. government is a big structure, after all, and it’s understandable that there might be some discrepancies. All I can tell you is that my USDA office (in Tumwater, WA) did NOT require that form for our October trip, and its absence didn’t cause any trouble at any point. I hope your trip is really fun — you’ve had an anxious moment or two now, but hopefully the rest will go smoothly! 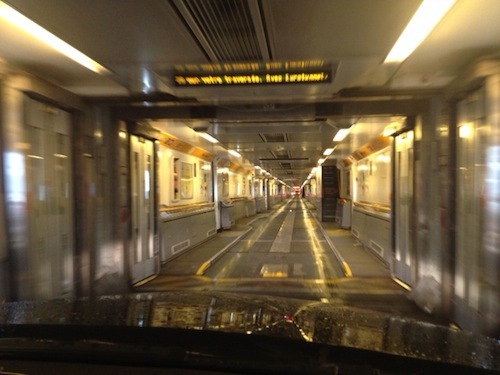 We travel on the Euro Tunnel every year sometimes twice a year to holiday in Europe and have done since 2008. We only travel this way so we can take our dog as we will not go anywhere without her. 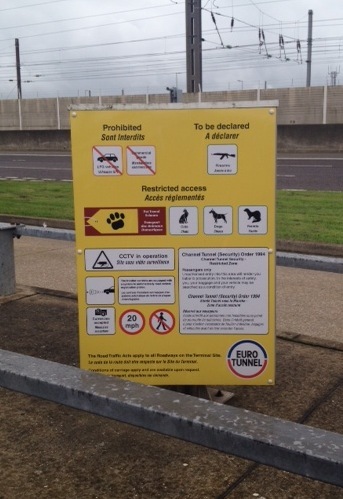 We returned last Sunday 13th July 2014 and went to get our dog scanned on the way back as usual, in the pet area at Euro Tunnel. I picked up all the magazines and leaflets as I usually do as I love anything animal related. So I was horrified and very upset to find a leaflet promoting animal research. It stated that the only we reason we can travel abroad with our pets and have the pet passport system is because of animal testing. When I got home I researched all the information in the leaflet and found out that the animal testing they refer to was all very old, some over 120 years old and was all done outside of the UK. Yet this leaflet was very current, glossy and clearly trying to condone future research. I contacted Euro Tunnel and spoke to the lady in charge of the pet scheme and pet area and she then got the director of press to contact me. DEFRA has apparently asked Euro Tunnel to be a research platform for Understanding Animal Research to try and gauge how pet owners respond to their literature and the issue of animal testing. Apparently I am the only person to tell them that I think it’s wrong so it’s going to be reported that pet owners are not upset about leaflets promoting animal research. They refused to remove the leaflets and basically stated that they were put there to get a response. I pointed out that this is very contradictory and far removed from their current campaign of we love animals and want you to take them on holiday with you instead of leaving them at home. I got the impression that this is just the start of a new promotion campaign to fool the public with misinformed, misleading and old research in glossy brochures with happy animals all over them. They are planning to try and sweeten the pet loving UK into accepting future animal research. So I expect to see leaflets in vets, doctors and hospitals soon! Thank you for the great blog post. 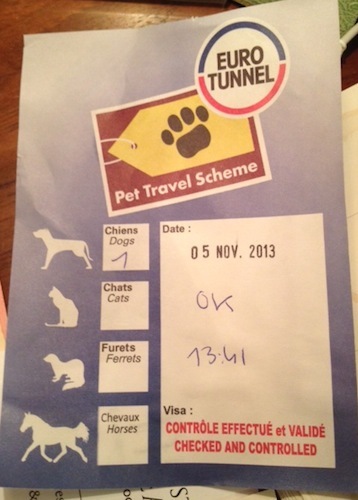 So is there no check of the pet passports at all when arriving in France via the tunnel? That was our experience, Paul. Indeed, nothing happens on either end on ARRIVAL — you just drive off the train and off you go. On DEPARTURE, in France, you jump through the U.K.’s hoops. On departure, in England, you don’t jump through any hoops at all, as far as your pet’s concerned. Hi there! Well, an update – i’ts been 9/10 months or so of living in Scotland! I thought I had updated on my trip here. Everything worked perfectly getting Duncan (aka, le pup) into the UK back in January. Your pictures were PERFECT for helping me figure everything out! As you mentioned, the French were completely not concerned with the dog arriving at CDG. I actually stopped the customs folks to tell them I had a dog with me! They “glanced” at the papers just to make it look like they were doing something! 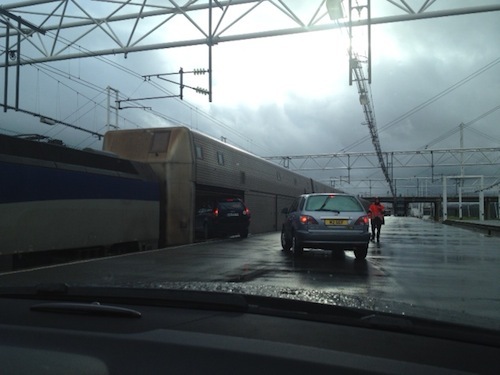 😛 The Eurotunnel of course there was a LOT more inspection from the English! As I’ve been in the UK more than 4 mo and I’m a resident, I am getting (finally) a pet passport. I plan to spend about a month in Florida over the holidays and then we will do it all again and come back to the UK. Wondering if there are any updates about flying dogs into the UK? 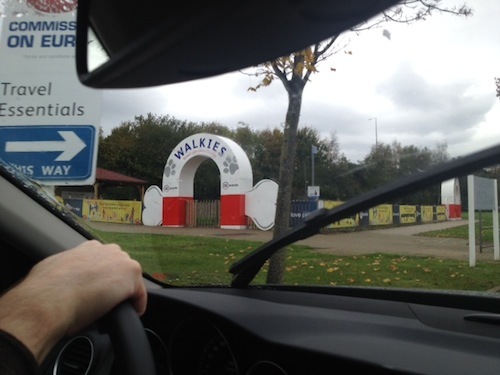 The vet here in Scotland seemed to think you could fly in depending on the airline….I’m quite skeptical about that. Before I buy my tickets though, I definitely want to see if I can fly in or if I’ll have to make the same trek from CDG through the chunnel etc…. Ack, Jules, I’m SO SORRY for the delay in responding. Thank you so much for the info!! And as far as I know, it is still NOT allowed to fly a pet in-cabin INTO the U.K. (leaving is do-able). thanks so much for this post. I’ve just discovered I can’t take our cats on board the plane from a destination in Europe to London and the fees for having them as cargo are exorbitant. I love your step by step description of the journey. I think that’s going to be the way to go… feel a bit more hopeful now! Hi 🙂 Totally in love with this blog. I’m from Brazil and I’m moving to England next year. Going nuts about taking my cat with me, I’ve never thought it would be this hard. Laws haven’t changed and I still can’t take Chemy with me in the cabin if I want to go straight to England. 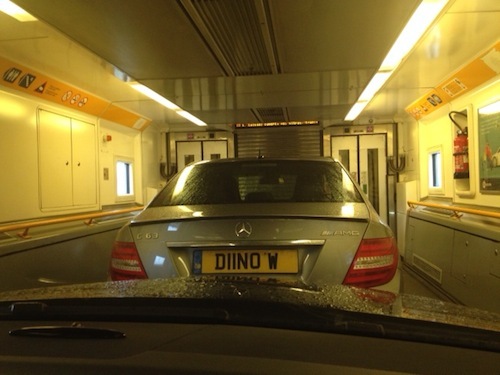 So, I saw this eurotunnel option this week and just can’t stop searching for more. Searching for the ideal carrier at the moment. Camila, have you tried calling up the Frankfurt airport to clarify matters? They might have a simple answer for you. Best of luck! When I flew into Paris and Brussels, no one cared at all that I had a dog… I stopped the customs folks just to be sure nothing had to be signed. They did a “I’ll look at your papers to look like I’m doing something” glance at my papers and said it was fine. 🙂 just make sure your airline has the dog /cat marked for being with you in their system and it should be fine. KLM has pet in cabin confirmation shown with your online reservation info…that was nice to see! (Rather than taking someone’s word that it is confirmed). You should check seatguru.com to see what kind of seat you can select, as some have power or entertainment boxes taking up valuable under seat space! You don’t want to not have space foe the carrier! For the long intl flight I brought pee pads and wouls bring the pup to the bathroom in the plane and let him move around out of the carrier and try to encourage him to pee and to drink water (wet food helps too). I felt better about letting him roam the tiny bathroom for a bit and he did go pee once. He also got to get out at the airport bathroom and went there…missing the pad altogether though so I had to clean it! Haha! Amsterdam is nice as getting outdoors is really easy for a walk…not sure about others. 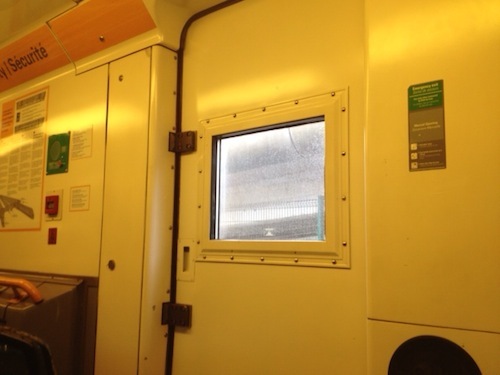 If you don’t have a car, I highly recommend the ferry from hook of holland to harwich – no vehicle needed – pet can go on trains with no issues. (Just not the train to the UK of course…but once in the UK pets can be on trains). Great blog! I’m about to travel with my pup from LA to Paris to The UK. I’ve got everything arranged but I’m confused about one thing. Do you need to get a tapeworm treatment in the US between 1-5 days before you enter France and then AGAIN in France before you cross the border into the UK? That seems excessive but that seems to be the requirement? As I recall, Mar, France does not have the tapeworm requirement, but the UK does — so we arrived in France without, then visited a vet in Paris to get the tapeworm treatment before traveling on to the UK. If you’re just passing rapidly through France, you may be able to time the tapeworm treatment in the US so it falls in the required UK window. Mar, it doesn’t seem to make veterinarian sense to apply tapeworm twice in 5 days, but I’m no expert, so why not check with the Pet Travel Scheme helpline (https://www.gov.uk/take-pet-abroad/complaints)? I guess that’s the confusion. All the pet travel schemes I’ve read and government websites seem to require a tape worm treatment 1-5 days BEFORE travel to Europe. so, that tapeworm treatment should still fall into the 1-5 days before we enter into the UK. We are only flying into Paris (not staying there) and then getting on the Chunnel. But the UK government site seems to say that if coming from France into the UK, I’d need to see a French vet for a tapeworm treatment. It doesn’t say anywhere that the tapeworm treatment in the US would cover this? Mary-Alice- Ahhhh, i see my mistake. The UK requires the tapeworm treatment but France does not. I’m hoping i can still get a tapeworm treatment in the US before traveling and that that will suffice for the UK as long as it falls into the 1-5 day travel window. If not. How does one go about finding a vet in Paris to get the tapeworm treatment? Can you recommend someone? Hello again, Mar! I’ve just spoken with the folks in the U.K. (telephone number 011-44-370 241 1710 and telephone call reference #1017200, if you need to follow up) and here’s the word. It does not matter whether the tapeworm treatment is administered in the U.S. or France, as long as it falls within the U.K.’s “window” of administration — which is, he clarified, between 24 hours before scheduled arrival and 120 hours before scheduled arrival. If your flight is delayed such that you start flirting with that 120 hour outer limit, the U.K. will be kind and understanding. They will only balk if your flight is canceled altogether (in which case you’ll regroup, and get together with a French vet for a re-do — the U.K. guy said that the French vet will know how to amend your forms). Speaking of your forms, your U.S. vet will include the tapeworm treatment info in the same set of documents that you’re already pulling together for travel to the EU/UK (the “third country certificate”). You no doubt already have this, but here it is again: https://www.gov.uk/government/uploads/system/uploads/attachment_data/file/434552/non-comm-model-animal-health-cert.pdf On the third page, your vet will fill out the bit under “Anti-echinococcus treatment.” PLEASE NOTE (and this is so great) that the tapeworm treatment part DOES NOT need to be endorsed by the USDA, so you can jump through the main hoops that are required, ahead of time, and get your paperwork endorsed by your local USDA office, and have all of that safely back in hand, and then you can return to your vet and get the tapeworm treatment within the required window. It is okay that your vet will be adding info to the endorsed packet. You do not have to return to the USDA for a second endorsement. That takes so much timing pressure off! This will make sense to your vet: Be sure that the tapeworm treatment s/he administers is “active ingredients” and contains praziquantel, in the dosage appropriate for your dog’s size. Mary-Alice – Thank you for this info. I actually ended up finding out the same information myself, but it was good to get a confirmation. I’m now going to break things up a bit by getting the health certificate filled out earlier in the week, getting endorsed the next day and then waiting until the day before travel to get the tapeworm treatment. And, as we are only flying into Paris and not staying in France, we should be well inside the tapeworm window when we travel into the UK. This whole international pet experience has been an eye opener. I’m PRAYING that sometime in the near future, you will be able to fly into the UK with a dog in cabin. I travel quite a bit internationally and I would never put my frenchie in the cargo hold. Only thing I’m STILL unsure about, is whether or not you can fly OUT of the UK with a dog in cabin. I’ve read some conflicting info on your website. It would be great to hear from some one who has actually done it! Thanks again for the info. Your website has been a big help! Some vets will be ok with signing off that you are giving the tapeworm medicine at a specific time, instead of going into their clinic. Depends on your relationship with the vet. To recap – I have taken the dog from the US to the UK twice – once following the Eurotunnel route in a rented car (and re-renting a car in the UK…returning the French one, then riding on the ferry back to the UK while my mom waited in a hotel nearby with the dog). The second time flying into the UK I flew into Brussels and then took a train to Hook of Holland with the pup (no issues at all) and we took the ferry to Harwich and it was perfect and easy. Once in Harwich you can rent a car (maybe there is a train stop, not sure). Flying OUT of the UK was fine, confirmed with the airline, had my “healthy to travel” signature in my Pet Passport, and paid the fee for the pet in cabin, and that was it! The second time I even just had the dog walking in the airport and not in his kennel and everyone loved him!! I had my flights through Amsterdam and you can get outside to actual grass and go for a walk before the longer flight. **What to look out for – flights that are code shared with airlines that do NOT allow pets! Delta allows pets in general, but from Scotland the Delta flights code shared with Virgin, which Doesn’t allow pets! KLM, Air France and Lufthansa are the three to go for. Please has anyone used one of the Pet Taxi services from CDG Airport to Felixstowe, and if so what was the cost for the trip with one little doggie. Hello Mary-Alice, thank you so much for your post, I have been in touch with Felixstone Taxi Service and they have quoted me £350 taxi fare plus £78 Eurotunnel fare, this is for collecting me and my little doggie from CDG airport to Felixstone, I really did not want to travel on the train with my luggage and my little doggie, so this is a wonderful way to travel for me, my husband will meet us in Felixstone, as he is travelling to the UK a few weeks before us.